There are no "guards" projected to go in the first round. I said before, it's a tackle heavy class and some of them might make the switch to guard. But as of right now, every first round offensive lineman was a tackle in college. Including Cody Ford. So as for us landing a good offensive lineman, we should be right in position to do so at 18. There should be plenty of options. Again, I really dont understand where you're coming from with this. As for the Pats covering well vs. the Rams, yeah, it was a great performance. However, I think it was a better game plan than coverage. I'd love to see a stat on how many times BB blitzed Goff. It was a lot and Goff crapped his pants. NE did the same thing to us when we played them. Overall on the season, the Pats defense was pretty porous when it came to defending the pass. They were 22nd in total pass defense which isnt very good by any means. As for our CBs, what top teams, outside of LA (which a lot fell on Barr's shoulders) did our CBs struggle with?? Looking at our schedule lets say the "top teams" we played were Chicago (x2), New Orleans, Seattle, New England, Philly and we'll even include the almighty Aaron Rodgers in there (x2). -The Saints game Brees was held to the lowest passing yards of his career with 120 and "threw" 1 TD (a shovel pass on the goal line that I could have thrown). This was all WITHOUT Xavier Rhodes. An elite type game by our CBs. -And the final Chicago game, Trubisky threw for 163 yards and 0 TDs. Excellent game by our CBs. So again, remind me where our CBs didnt show up against top teams?? Our DBs "allowed" SEVEN touchdown passes in 8 games against "top teams". 2 TDs which came late in the 4th vs Philly when we had a big lead and another that was a shovel pass vs NO. So essentially our CBs legitimately gave up 4 true TD passes in 8 "big" games. And shut down just about every QB they came across in those games. That isn't just good play from your CBs. That is elite play from your CBs. And yeah, NE lost Chung during the SB....we lost Rhodes vs one of the best passing offenses in recent memory in New Orleans and held Brees to his lowest yards ever in his career. I've never heard anyone being upset with a CB group that is this good and this deep. We dont need another corner. And I sure hope we dont spend another first round pick on one. This group is as good as it gets and is very deep. Simple as that. The Rams game was the only really bad game by our secondary. 3 WRs hit 100+ yards, with the most coming against Waynes (who had an awful game covering Kupp). Outside of that game, no WR broke 100 yards all season and only MT, who had a historic year reached 89. That game was an interesting one, because it highlighted just how big of a drop-off Weatherly is from Hunter. The Rams were able to double Hunter at RDE, and Weatherly never even sniffed the QB at LDE...or the RB for that matter. Yeah and that was Waynes' only bad game of the season. Outside of that, he played lights out. As a fan, you couldnt ask for better play out of your CBs right now and probably couldnt ask for better depth either. Jacksonville probably has the top duo. But we have the top trio IMO with how Mac played this year. Then add Hughes and Hill to the mix.....not a team in the league can touch our depth. Our #4 and #5 CBs could probably start on at least half the teams in the NFL. The last thing we need to do is draft another CB early. As for the drop off with Weatherly, I agree. I love him as a #3 DE but not a starter. This is why if we decide to move onto Griff, you could see DE taking a priority over OL in that first round. Which wont bother me too much as long as we address OL in the 2nd and beyond. Did you mean "how big of a drop-off Weatherly is from Griffen? Not sure what happened with Griffen in his time away, but he seemed far less enthusiastic and was really average. So even if Weatherly didn't step in and match pre-AWOL Griffen, I think he more than matched post-AWOL Griffen. 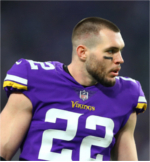 Its just really hard for me to think Spielman and Zimmer are OK with continuing with Griffen at this point. I understand the desire to be supportive and give a second chance, but can the team really afford to spend that kind of money and soak up a critical spot on the 53-man roster for a guy who just up and vanishes, no matter how talented he may be? I said it during the season and I'll say it again - I will be shocked if Griffen is a Viking when training camp starts this year. I think there is a very good chance he'll be released outright, but if not, they'll ask him to take a major pay cut. He might take it, but that's the only way I see him remaining with the team in 2019. I feel like playing DE is all about anger and emotion. Given what Griffen went through I would imagine he was just emotionally drained the rest of the season and afraid to let himself be overcome by rage to get at the QB. Nope, I meant Hunter, the player he replaced on the line. Hunter replaced Griffen, not Weatherly, and if we move on from Griffen, who had a similar per snap sack % as 2017 last year, it will be the same story. A better RDE for sure, but a massive downgrade at LDE. As for "more than matched Griffen post-AWOL", he didn't even play the same position, so I am not sure how that is possible. Are you sure about that? I admit I didn't pay close attention to where Weatherly played exactly, but I thought he played at Griffen's position on the line and Hunter stayed where he was. If that wasn't the case, I guess I didn't notice. Regardless, and even if Hunter did shift to Griffen's position, Griffen wasn't the same player post-AWOL. Weatherly didn't improve anything either, but I guess the point I'm trying to make is, if the defensive line overall post-AWOL-Griffen is no better than the defensive line with the much less expensive Weatherly on it, why pay a premium for post-AWOL Griffen, regardless of where he, Hunter or Weatherly play on the line? Weatherly did play in Griffens spot for the most part, and did a better job, esp. on the run, then Grif did. Its sad, but its time to let Griffen go. And draft a 3rd or 4th rd DE. Let Zimmer coach them up. I dont think Weatherly played better than Griff at all. Weatherly was adequate and a good fill in guy, but even with Griff having a down year given what went on, he's still far superior to Weatherly. Maybe Weatherly can develop into a starter but not right now. Griffen is still a top pass rushing DE. Pretty sure. Watch some offensive highlights of teams opposing the Vikings while Griffen was out (there are a lot of them), and you will see Hunter playing RDE. It is no coincidence the two worst games by the Vikings D were while Griffen was out, and that the defense improved as the season went on and Griffen got back to form. He was almost always around the QB when he was in, even if he wasn't getting the actual sack, and forced QBs to get rid of the ball quicker than they wanted too. We lose him and this D-line goes from one of the best in the NFL, to average. I'm throwing Hunter in here as a reference point. I don't have time to confirm what Stumphunter is saying about Hunter shifting over to Griffen's spot on the line and Weatherly taking the LDE spot while Griffen was out, but I think the stats will show it really wasn't significant regardless. Now, Griffen has been in the NFL for 9 seasons (hard to believe) and Weatherly is a 3rd year player while Hunter just put in his 4th season as a pro. So we're also looking at relative career track and performance to this point and that isn't going to be apples-to-apples, but I think it is helpful given the contract Griffen has compared to both Weatherly and Hunter. Griffen's career stats (http://www.nfl.com/player/eversongriffe ... areerstats) show his production peaked in 2014 when he totaled 57 tackles and 12 sacks. Up until 2018, his performance trailed off just a little, but not much, and in fact he had his best season in terms of sacks (13) in 2017. Weatherly (http://www.nfl.com/player/stephenweathe ... areerstats) doesn't have the career stats to compare to Griffen, mostly because he's a 3rd year backup, but his first 16 game season was 2018 and his stats in that season compare pretty favorably to Griffen's first 16 game season back in 2011. Hunter, by comparison, has been a beast by any measure (http://www.nfl.com/player/daniellehunte ... areerstats). His most recent season statistically beat Griffen's best season ever by a pretty wide margin in total tackles and his sack total exceeded Griffen's best total by 1.5. Granted, Hunter's totals might have been relatively better if he did move to take over Griffen's spot on the line, although we know that Griffen was AWOL for a full 5 games and saw limited action in his return game, so any benefit to Hunter's overall production in 2018 would have been no more than about 5.5 game's worth, or less than half of the season. But Hunter's numbers far exceed any boost that a mere 5.5 games of playing in Griffen's spot on the line could give him IMHO, so I think it's just fair to give Hunter his due and acknowledge that he had a real coming out party this year and looks to be the real deal at end regardless of where they play him going forward. I guess based on these stats and game logs I'm not sold that Griffen's production cannot be replaced by Weatherly, and even if it can't, the relative investment point is still valid. That is, can the Vikings really afford to pay Griffen superstar money at defensive end if they can't rely on him? Even if there is a drop off in performance, can they really sink those kinds of cap-limited dollars in him? Those 5.5 games Griffen missed all counted the same. When people talk about the Vikings missing the playoffs, and missing by only a single game, and if they further claim that Griffen's production can't be replaced because he's such a special talent, well, doesn't that also say that it's likely Griffen's absence cost the team that one win they needed in that 5.5 game stretch? 2 of those games were losses. In fact, the first 2 of those games were losses, and one, against Buffalo, was a really BAD loss at home against one of the worst teams in the NFL at the time. Another loss was also at home against the Saints in Griffen's first game back where he didn't start and got only partial reps. Maybe at least one of those 3 losses isn't a loss without the distraction caused by Griffen going AWOL? Don't get me wrong - I like Everson Griffen. I was thrilled when Spielman managed to snag him in the 4th round the year he came out and have rooted for the guy every year since. I do think he actually is a special talent capable of making a direct impact on games. But, I don't think the Vikings can afford to just sweep his sudden and extended absence in the middle of an important season under the rug, especially when they're paying him to be a bedrock player on the team. His absence cost them in multiple ways. His contract will place some restraints on what they can manage in free agency this offseason. It's not a minor thing to plow forward with Griffen at his current salary level given the obvious and pressing needs all along the offensive line. Yes, the defensive line might not be as good without Griffen, but I think given everything we know I'd sacrifice Griffen and go with Weatherly if it meant the offensive line can improve significantly. That's a tradeoff that is worth making because even if Weatherly isn't going to make as much of an impact as Griffen might have made, the drop off won't be all that steep IMHO, at least not based on the stats shown here. Sorry, I still think Griffen has either got to renegotiate that contract down significantly or the Vikings should move in another direction. Again, Weatherly is not going to replace Griffen, he will replace Hunter. Hunter will replace Griffen. Hunter is arguably the best run defending DE in the NFL. He is also a great pass rusher, but the run defense got significantly better when Hunter began starting over BRob. You move him to RDE full time and his responsibilities change. He might get more sacks than Griff over there, but on the other side you will see a big droppoff against the run. Especially with Barr likely gone. First off, great write up and analysis. See with me, I'm not sold on Weatherly yet. Could he become a good DE, for sure. I just dont see him as being a dominant DE like Griffen or Hunter are/were. That's why I dont believe we should let Weatherly take over if we move on from Griff. I think Weatherly is your perfect #3 DE that can fill in when needed. Similar to B-Rob when he was toward the back end of his career. As for Griff, his play has certainly dipped. My thing is, this year was a very weird year for him to judge if he's really done or not. Age could be a factor, yes. However, B-Rob played until he was like 35 and stayed fairly effective. And Griff is definitely the superior DE in that comparison. I personally think that if we cut him outright, it's a mistake. UNLESS, his mental state is not where it needs to be and/or he's done playing football. If he's "back to normal" and under control, I dont think we should get rid of him. The tricky part is if we want to go to him about a restructure, I'm hoping he takes it. Because if he doesnt, we're then in a situation there. In my mock offseason, I had us restructuring him. It's definitely going to be interesting. And on a side note, I do understand where Stump Hunter is coming from. When Griff was out, Hunter switched sides. Which is a bigger difference than some think when players do that. Basically if Griff is gone, our left defensive end spot would be what is vacant. In order to have a dominant DL like we have the past few years, we need two stud DEs. IMO, we wont have that with Hunter and Weatherly. We need to pair Hunter with someone legit. IMO, that would be Montez Sweat out of Mississippi St. Some will see Sweat as a leggy edge prospect with average play strength and a lack of refinement in his pass rush. I see a talent, similar to Danielle Hunter out of LSU, with above-average length and a prospect who should continue to grow into his frame, allowing him to unleash his rush flashes into a consistent attack. His transition as an NFL rusher will take some time, but like Hunter, he should come out on the other side as a good, impact starter as an every-down edge defender. If Griffen is indeed washed up, I just don't want us going into the season with Weatherly as our LDE. I have watched two DE's very recently who sat behind established starters, and it was very clear that both Hunter and Griffen were going to be impact players. I don't see that with Weatherly. He might be a solid backup, or even a starter on an average d-line, but he is not an impact player. An impact player is what this defense needs at both DE spots for Zim's defenses to be effective. Without it, we go from top 5 to top 16 on defense. I personally think that if we cut him outright, it's a mistake. UNLESS, his mental state is not where it needs to be and/or he's done playing football. If he's "back to normal" and under control, I dont think we should get rid of him. How can the Vikings know where his mental state is? His meltdown last year caught everyone by surprise. Since someone's mental state can be very hard to assess, while the cap dollars allocated to him are easy to assess, is that an acceptable risk for the Vikings to take for whatever bump in performance they're getting, once again assuming Griffen is even on the field? I could see Sweat becoming a very good player. Not an immediately good player, but good, potentially even great, within 2-3 years. He won't be available after #18, though, and in many mocks I see him going even before #18, so Spielman would have to put his big boy pants on to make that pick in the 1st. Just to summarize my position on this - I'd love to see Griffen stay with the Vikings, just not at his current salary. I don't think they can count on him, and this is a team sport where everybody has to give it everything every game, especially where just a few plays here or there can make or break the entire season. Spielman and Zimmer and the Wilfs and the state of Minnesota have put way too much into this to think rolling the dice by hitching themselves to unstable, if overtly talented, players is going to get it done. Reward has to balance risk, and Griffen's behavior last season should make it abundantly clear his current contract is unbalanced, especially when at least a portion of those dollars can be invested in improving an offensive line that desperately needs it if the team has any real hope of recouping another major investment recently made in the QB position. So for our 1st round pick we select a guy and have him switch positions. As your G example. I wouldn't do that. There is a difference in the skill set of a G and OT.